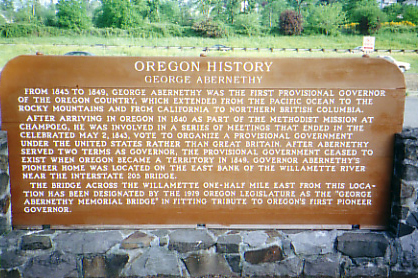 From 1845 to 1849, George Abernethy was the first Provisional Governor of the Oregon Country, which extended from the Pacific Ocean to the Rocky Mountains and from California to Northern British Columbia. After arriving in Oregon in 1840 as part of the Methodist Mission at Champoeg, he was involved in a series of meetings that ended in the celebrated May 2, 1843, vote to organize a Provisional Government under the United States rather than Great Britain. After Abernethy served two terms as Governor, the Provisional Government ceased to exist when Oregon became a Territory in 1849. Governor Abernethy's pioneer home was located on the east bank of the Willamette River near the Interstate 205 Bridge. The bridge across the Willamette one-half mile east from this location has been designated by the 1979 Oregon Legislature as the "George Abernethy Memorial Bridge" in fitting tribute to Oregon's first pioneer Governor.